On Sunday night, we like to get ready for the work week ahead, have a comfort meal, and watch some TV. This weekend, AMC ran a Godfather marathon, which seemed perfect to watch while eating steak and drinking red wine. With The Godfather Part II as a backdrop, we grilled some delicious porterhouse steaks, and popped the cork on a wine that’s been in my cellar for a few years. Sipping the Napa Cellars Merlot 2007 with Michael Corleone was a perfect way to end the weekend. How Do We Grill Our Steak? We’re steak purists. This is not to imply we don’t like interesting and exciting preparations for our steaks. I’ve have some amazing steaks with sauces that could blow your hair back. However, when we pull out the Weber charcoal grill, we only season our steak with two ingredients. Those ingredients are salt, and pepper. We grill the steaks over a high heat for about 5-7 minutes per side, and pull them off medium rare. Then, we pour the wine. Part of the Trinchero Family Estates portfolio, I’ve written about Napa Cellars wines in the past. This bottle was a sample that I received in 2010, so it’s been sitting in my cellar a while. 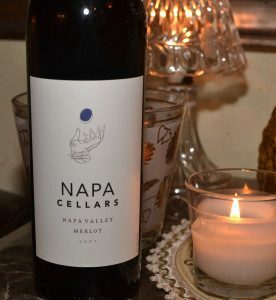 I opened the Napa Cellars Merlot 2007 about 30 minutes before we were ready to eat, and poured 2 ounces or so into a glass. This allowed the bottle to open up a little, and I was able to sip on some of the wine while grilling the steaks. The wine was an opaque purple to garnet color in the glass, with an aroma of fresh blueberry and brambles. The palate was full, having great layers of blueberry and vanilla, with wonderfully integrated oak in the form of warming cedar and spice that is noticed on the mid-palate and finish. This wine really benefited from the 30 minutes of air, and certainly evolved over the next hour as it was slowly sipped. We do tend to eat a lot of red meat, steak being on the menu at least twice a month. 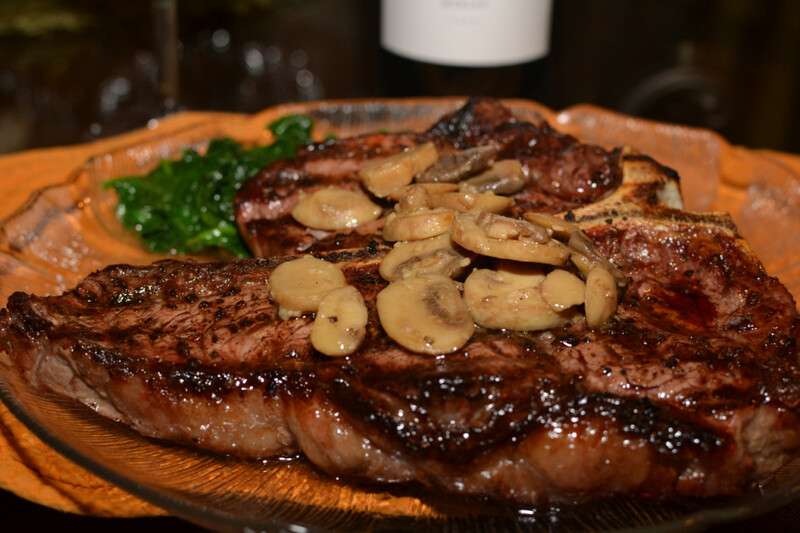 While we usually pair a Cabernet Sauvignon, we’ve been known to break out an Italian red wine for steak before. Merlot does not make it into our glass often, but not because we aren’t fans. Rather, it’s a wine we just don’t seem to grab from the shelves often enough. However, as the Napa Cellars Merlot shows, Merlot a great wine time and time again. 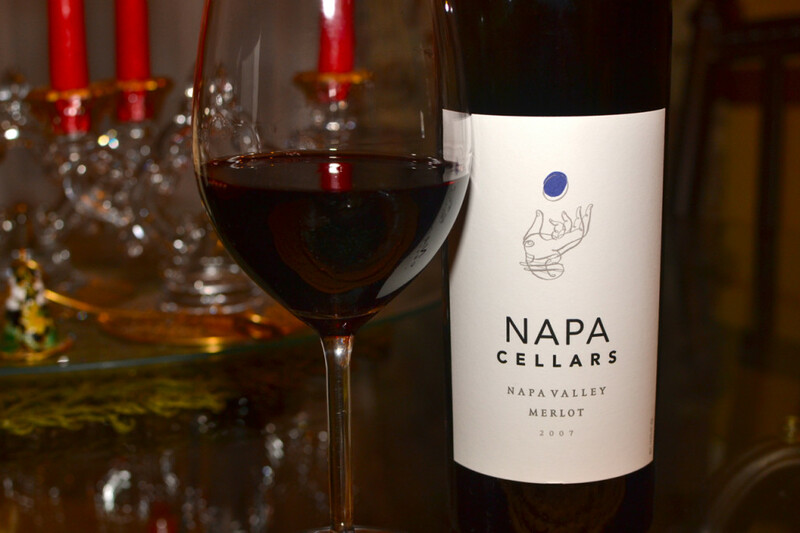 At $22, the Napa Cellars Merlot 2007 is aged in new and 1-year old American Oak barrels, is 100% Merlot and is 14.5% ABV. When Fred from Norcal Wine reviewed the wine in 2010, he recommended it, saying it would drink through 2013, though it’s doing fine in 2014 in my opinion. While you’re not likely to find the 2007 vintage in stores, I would not hesitate to try the current, 2011 vintage of this wine. Napa Cellars wines deliver time and time again, and at a price that’s more than reasonable. What are your thoughts on Merlot? Let me know below!